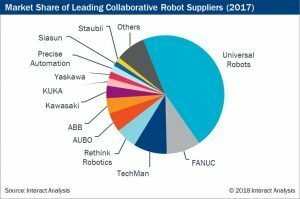 Universal Robots continued to dominate the collaborative robot industry in 1H 2018 although we estimate its market share dipped a little this year. Yet despite the exit of cobot pioneer, Rethink Robotics, UR faces an increasing number of challengers and the fledgling industry remains fragmented. Universal still maintains an incredibly strong hold over the collaborative robot market; however, its market share has gradually decreased from more than 55 percent in 2016 to 46 percent in 2017 – which was inevitable given how quickly the industry is growing and the increasing number of suppliers now competing. We estimate that its market share dipped further, to around 40 percent in the first nine months of 2018, despite growing its revenues by more than 40 percent. Although still dominating the market, Universal Robots will face a much more challenging environment in 2019 and beyond to maintain its market share. Firstly, it faces fierce competition from rival Taiwanese and Chinese suppliers who are offering very similar products (that function and nearly look identical to UR’s robots) at a lower price. Secondly, it now faces competition from almost every major industrial robot vendor who are now also marketing their own collaborative robots. The products from this group of companies are typically more ruggedized and potentially better suited for larger manufacturing customers. 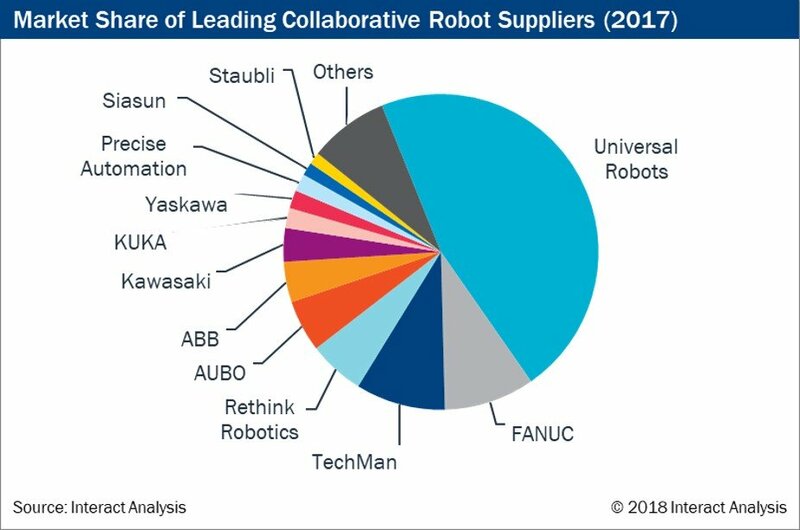 When viewing the 2017 market share of collaborative robot vendors, UR’s dominance is very clear: no other vendor had a share of 10 percent or more. Now in late 2018, there are more than 30 companies active in the market and we expect the ranking and share of the various suppliers will change considerably in the future. In addition to the increased competition that traditional industrial robot vendors will bring for Universal Robots, they are also broadening the scope of collaborative robots by introducing to the market a much wider range of products. UR’s products have been limited to applications with payloads of 3kg to 10kg; however, the new entrants have products that are suitable for payloads as low as 0.5kg and as large as 170kg. The 170kg payload product from Comau is somewhat of an outlier; however, there are now many products available above Universal’s highest payload of 10kg and even more offered below 3kg. With so many competitors’ new cobots being offered outside of Universal’s payload range it seems inevitable that it will lose further market share overall, unless it broadens its portfolio further. Conversely, the opening up of new opportunities for cobots by its competitors offering much smaller and larger products, and the increased awareness and acceptance of cobots that comes with this, will undoubtedly serve to benefit Universal Robots and the wider industry in the long term. Given the relatively small size of the collaborative robot market – it was worth less than $400m last year – a large number of suppliers are in operation. We identified more than 30 vendors that are currently marketing over 80 cobot models, and we expect this number to grow. More than 80 percent of collaborative robot suppliers generated less than $10m in revenues last year. However, many of these companies have only recently released cobot solutions and as such are only selling very low volumes currently. Although the industry is set to grow rapidly in the next 5 years, it will remain relatively small for the number of suppliers active ($2.7bn in 2022). As such, it is very likely the industry will consolidate somewhat with weaker suppliers exiting the market.